Before I get into my main topic, allow me to present a bit of follow-up to last week’s discussion of occupancy rates in our newer apartment buildings. Some of the comments to that post raised the question of how much of the rental activity is short-term, and how much is being made by corporations rather than individuals. I put the question to our Aaron Aknin, Redwood City’s Assistant City Manager/Community Development Director. He indicated that there had indeed been a problem with short-term (less than 30 day) corporate rentals, but that the offending companies have agreed to only do month-to-month rentals at a minimum. Aknin went on to note that our Housing and Human Concerns Committee (HHCC) is looking into extending minimum lease terms; if they recommend that the city require minimum lease terms to be longer than 30 days, expect the City Council to take up the issue later in the spring. It is my understanding that about 5-15% of some of the 201 Marshall, Marston, Greystar 1 [Franklin 299], Radius and Township (latter two outside DTPP area) are rented to Synergy and Oakwood (not sure if there is a third company), corporate housing providers that operate in most cities around here. Synergy and Oakwood then rent to companies who place their new employees in the buildings with minimum month to month leases. I believe FB is one of their clients. Many of the employees stay beyond 30-days or a few months and become permanent residents. The apartment buildings typically don’t exceed 15% as a business practice—they don’t want a large block of units to go vacant at once if a company or industry slows down. It is my understanding that Indigo does not have corporate rentals, and Locale rents a certain percentage to students who live for the school year or more. 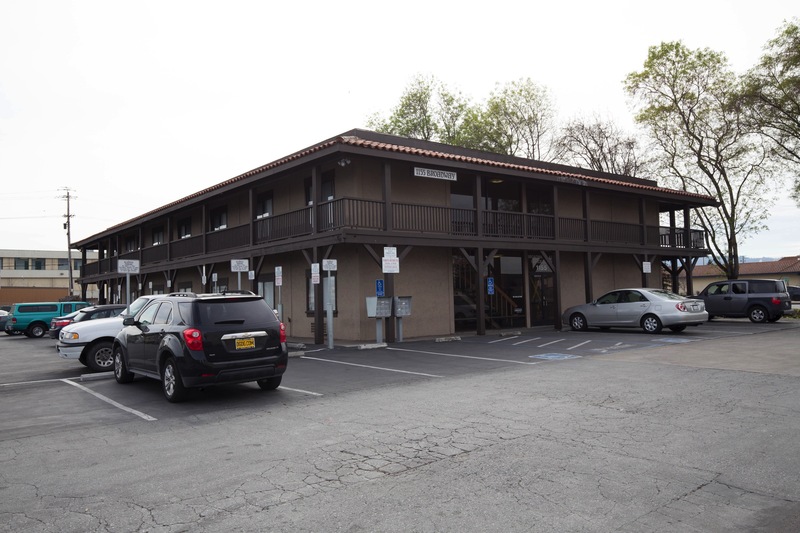 With the HHCC considering the minimum length of lease terms, in February the City Council directed city staff to look into the feasibility of restricting corporate housing to a certain percentage of a building. This doesn’t appear to be something that is being done in other cities in the area, so staffers will either need to find a model upon which to base a proposal, or will have to come up with something altogether new. …we do not have a short term rental ordinance, and there are Airbnbs throughout the city. Most are located outside the DT area. We are intending to bring forward an ordinance soon that we require collection of TOT through the website, require that it be the person’s primary house that they are placing for rent on Airbnb (to prevent people from leasing or buying multiple units for Airbnb purposes) and restrict the total numbers of days per year that a property could be listed. This should move forward before June of this year. This week I caught up on a couple of meetings I had been unable to attend in person. One that I had been very much looking forward to—Monday’s City Council meeting—didn’t disappoint. While the agenda didn’t have any highly controversial topics, the main item of discussion related to an amendment to our General Plan that would allow a good-sized affordable housing project to be built in a somewhat unconventional area. Affordable housing is an issue that I am very interested in, and its proposed location—in an area known for (and zoned for) light industrial businesses—has some real pluses and minuses. So I watched the meeting with great interest. First off, I should note that it is very early days for this particular project, and that as it goes along we citizens will have many opportunities both to express our opinions and to hear from all sides. Indeed, the issue before the Council was not whether the city’s General Plan should be amended to allow a housing project to be built at the corner of Charter Street and Bay Road, but simply whether city staff should take the time to analyze and review what such a change would mean. As you probably know, The Sobrato Organization (not Facebook or Google, as rumors would suggest) has proposed redeveloping the large shopping center at the corner of Woodside Road and Broadway, replacing the mostly now-empty center with a mix of offices (420,000 square feet within three five-story buildings), residences (400 market-rate apartments), and some retail (including a 10,000 square foot CVS store on the corner of Woodside Road and Bay Road, plus a small retail storefront on Broadway). 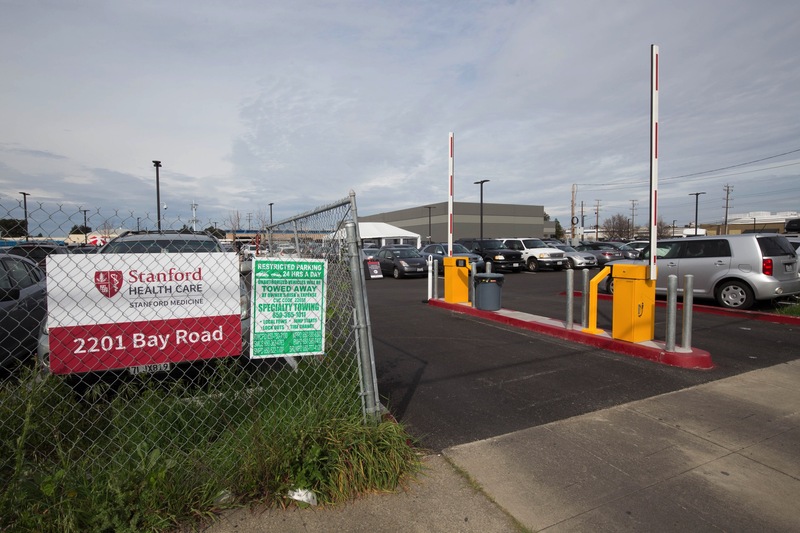 This project would be subject to Redwood City’s affordable housing impact fee: for this particular project the developer has the option to either pay $15 million to the city’s affordable housing fund or to build 82 affordable units either on or off site. The Sobrato Organization is exploring the latter option, and has purchased two properties directly across Woodside Road from their proposed “Broadway Plaza” development. On one of these properties they propose to build, in partnership with the highly respected MidPen Housing—120 affordable units. Because the project is still very preliminary, the design may well change before they are through. And also preliminary, but interesting nonetheless, is just who might qualify to live in these one, two, and three bedroom apartments. MidPen Housing is suggesting that 48 of the units might be reserved for those at the Very Low income level: people who make no more than 50% of the Area Median Income (AMI), which currently works out to $43,050 for an individual or $61,500 for a family of four. The remaining 72 units would be for those making no more than 60% of the AMI ($51,660 for an individual or $73,800 for a family of four). 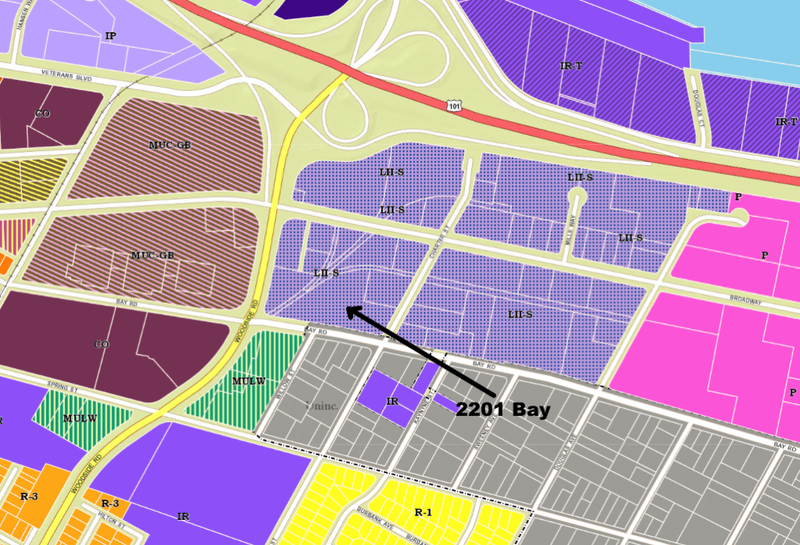 MidPen Housing anticipates that they might receive somewhere between 2,000 and 4,000 applications for these 120 units, so while they would use a lottery system to select among qualified applicants, they plan to give preference to those who work in Redwood City. Finally, I should note that this project would be tied to the Broadway Plaza development across Woodside; it would be built and brought online concurrently with that other project. I’ve added an arrow showing the property where the proposed apartment complex is to be built. 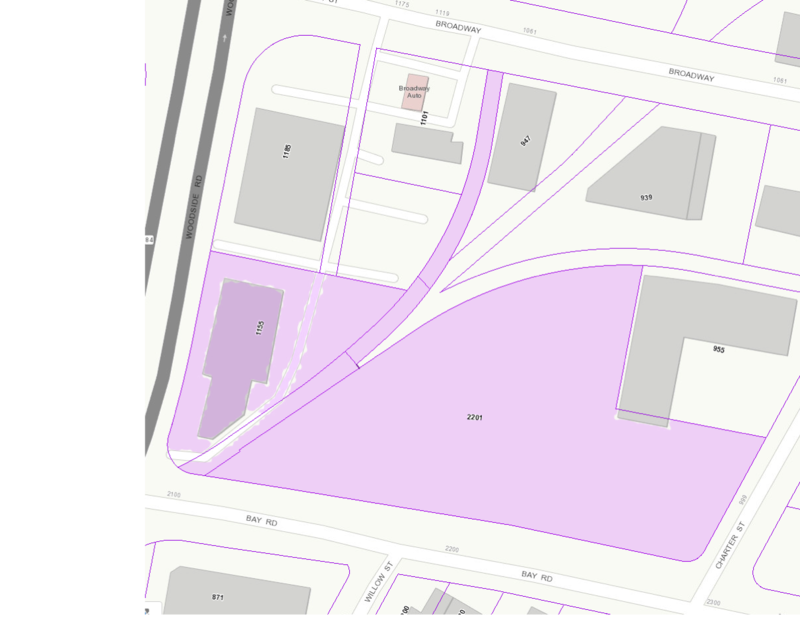 As you can see, that block, along with three others, all share a common zoning: LII-S. LII stands for “Light Industrial Incubator,” while the “-S” indicates that the area is also designated as an area where an emergency shelter is allowed. This last is due to a requirement imposed by the State of California that each city and county identify an area where emergency shelters that serve homeless individuals and families are allowed as a permitted use. But the LII designation indicates that the area bounded by Woodside Road, Highway 101, Douglas Avenue, and Bay Road be used “to promote opportunities for small and expanding light industrial businesses.” Clearly an apartment complex does not fall within this intended purpose. This mismatch is what the City Council has asked city staff to address: what are the implications of changing the zoning for the block upon which the affordable housing development is being proposed? My understanding is that the zoning would change to “Mixed Use – Corridor” (MUC), which would match the property directly across Woodside Road where the shopping center now stands. MUC zoning allows for a variety of activities. Re-zoning would not necessarily preclude the light industrial activities that are allowed there today, but would expand potential uses to include offices, high-density housing, and even commercial spaces as well. But neighboring businesses within the existing LII district are concerned that this would open the barn door to further development that would not support the light industrial nature of the area. Indeed, a handful of people spoke up at the City Council meeting to make this very point. These four blocks were set aside for this particular purpose, they noted, and by allowing “non-LII” uses like this it would make it even harder for small industrial start-ups to find a home. I should note that on the corner of Woodside and Broadway is Smart & Final, a grocery store. And at the corner of Broadway and Charter is Summit Preparatory Charter High School. Both are in the LII zone, and neither seems to qualify. While one could look at those exceptions as reasons to allow this new development, too, one could also look at them as further examples of the Light Industrial Incubator district being chipped away. The Council voted 6-1 to allow city staff to study the change to the General Plan and the city’s zoning for this block. The next step will occur when the results of that study, along with a likely proposal to change the plan and zoning, are brought before the City Council for consideration. This would be the second of many steps that will need to occur if this project is ever to get built. 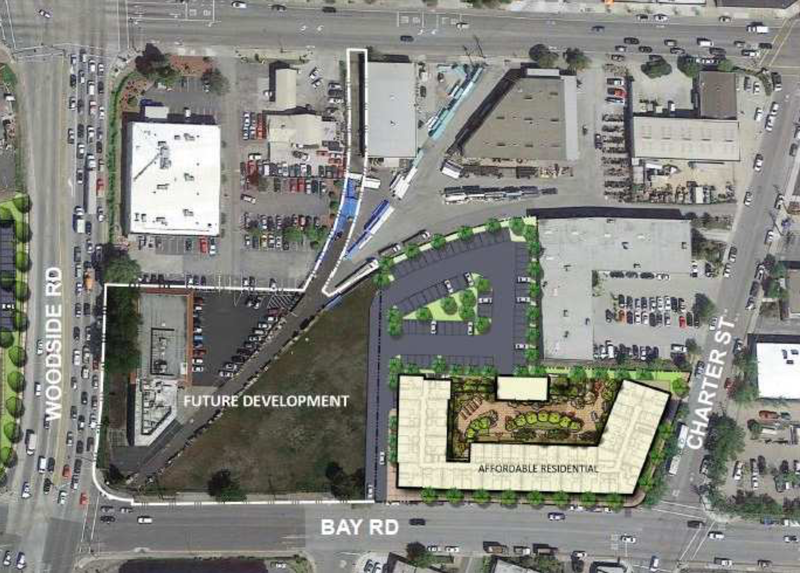 If this project piques your interest, as it does mine, keep an eye out for City Council agenda items relating to 2201 Bay Road or 1401 Broadway (which is the Broadway Plaza project, proposed for just across Woodside Road). The Magical Bridge Foundation is making great progress in securing the funding necessary to bring a Magical Bridge Playground to Redwood City’s Red Morton Park, but they still need our help to complete their funding drive. If you haven’t had an opportunity to visit their flagship playground at Mitchell Park in Palo Alto (600 E. Meadow Road; it is all the way in the back), I highly recommend it. The Magical Bridge Playground is designed to accommodate everyone: those with physical and mental handicaps as well as the able-bodied. Magical Bridge “levels the playing field” and allows everyone to enjoy a whole host of activities together. Seeing people of all ages and abilities happy together truly is a magical experience. Check out the video on their website, and then click the “Click to Donate” button to join me in making this new type of playground a reality here in Redwood City. Greg, excellent follow up to last week’s post! 1) I have been told by multiple housing non-profits that preference cannot be given to Redwood City residents for affordable housing projects built in our town. That is according to Fair Housing Law. The only exception is when city-owned property is involved. Maybe Mid-Pen can clarify their statement? 2) If apartment buildings don’t typically exceed 15% with corporate units, then why the need to correct that in Redwoid City? I believe the percentage here is much higher. Since there is nothing to stop an apartment owner from exceeding 15% with corporate clients, why would they? Would they rather sit on empty units? There is nothing “typical” about the explosive growth of Facebook and Google and the local ramifications on our housing market. I believe that Mountain View gives preference to city residents for some affordable housing building units although I’m not sure who owns them. Yes, I recall the track that long ago forked into 3 tracks (to directly serve various rail freight customers) after diagonally crossing the Woodside & Bay intersection. Of course, that track branched off the current and still quite active Chestnut Street Union Pacific spur track off the main Caltrain line which serves Granite Rock and the Port of Redwood City east of Hwy 101. Another track used to branch off that same still-active Chestnut St. track between Veterans and the Hwy 101 overpass. That track split into more tracks which crossed over Hansen Way and which ran along and behind the businesses in the buildings housing Tuesday Morning and the Wag Hotel. In fact, anyone examining that area on the ground can still find clear traces of the tracks in the pavement through there. Because trains (and therefore their tracks) can only make relatively wide, gradual turns, pretty much anytime you see curved parcels or walls of buildings in former or current industrial areas, it’s a sure sign there used to be railroad tracks there. And if you look closely, you can often find a rail or two still embedded in the ground or pavement. Over the last 4 years or so I’ve come to the conclusion that the best way to solve the housing/office space problem is to severely gut zoning. Let the private capital flow. Have you come to a similar conclusion Greg? In the case of Redwood City, I would take the limits off all non-suburb/marshland space immediately, come up with some sort of fee package to offset the nuisances, and see where that goes. If that means 30 story apartment complexes, fine. Prime real estate on veterans blvd, would be a nice test case as a half measure. I see very little worth keeping compared the needs that would not be offset by the benefits. Also wouldn’t hurt that these mongo buildings would cut 101 noise to the west. There are openings on the Planning Commission in June. I’ve always wondered why the area around Smart & Final and the brown office building was oddly shaped. Looks like it is because of the railroad tracks. Thanks for that information!